View of the Santa Cruz de Manga Islands, Boca Grande and Castillo Grande, and Tierra Bomba seen from Cerro de la Popa. Cartagena de Indias, Colombia. Cartagena de Indias (pronounced [kaɾtaˈhena]) is a large seaport city on the northern coast of Colombia. Founded in 1533, by Spaniard Don Pedro de Heredia, it was a center of early Spanish settlement in the Americas. It gained fame in the mid-sixteenth century when gold and silver from the mines in New Granada and Peru were exported from there for convoy to Spain. The city's history includes its role as a center for the Spanish Inquisition and as a major slave market. It saw expansive development in the eighteenth century as the de facto capital of the Viceroyalty of New Granada. Cartagena became the main hub of commerce and transportation in the late viceroyal era, and continued as a seat of commerce into the modern era. Colombia’s notoriety for illicit drug production, kidnappings, and murder required efforts to foster stability. To achieve this, Colombia increased its military strength and police presence throughout the country. 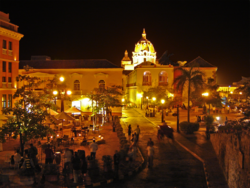 These efforts have helped Cartagena capitalize on its pleasant climate. The remains of extensive Spanish fortifications dating from its colonial days have earned it status as a UNESCO World Heritage Site of cultural importance. Cartagena faces the Caribbean Sea to the west. To the south is the Cartagena Bay, which has two entrances: Bocachica (Small Mouth) in the south, and Bocagrande (Big Mouth) in the north. The old colonial walled city and fortress, a UNESCO World Heritage Site, are located on a peninsula and the island of Getsemaní. The city has spread over the islands of Manga and Manzanillo, and on the mainland. Due to Cartagena's tropical location, the climate changes little throughout the year, with an average high of 88.6°F (32°C) and an average low of 77°F (25°C). 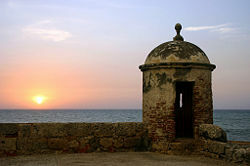 Cartagena also averages around 90 percent humidity, with a rainy season typically in October. Cartagena receives about 40 inches (1000 mm) of rain each year. The Walled City has four sectors: San Diego, named after San Diego Convent, now the Beaux Arts School Building; La Matuna, the commercial and financial area; Getsemaní, where African slaves once lived; and Santo Domingo. Downtown is the heart of the city, with colonial and Italian style buildings, such as the cathedral's bell tower. The official entrance is through Puerta del Reloj (Clock Gate). A few steps further is the Plaza de la Aduana (Customs Square), next to the mayor's office. Nearby is San Pedro Claver Square, and his namesake's church, as well as the Museum of Modern Art. 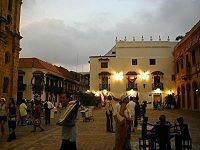 Nearby is the Plaza de Bolívar (Bolívar's Square) and the Palace of the Inquisition to one side. Nearby is the office of Historical Archives, with the Government Palace, the office building of the Governor of the Department of Bolivar. Across from the palace is the Cathedral of Cartagena which dates to the 16th century. Bocagrande (Big Mouth) is the most modern area, with hotels, shops, restaurants, nightclubs and art galleries. It forms part of a land extension delimited by Cartagena Bay to the east and the Caribbean Sea to the west, where you will find El Laguito (The Little Lake) and Castillogrande (Big Castle). Originally constructed for foreign oil workers, most land was reclaimed. Bocagrande is a popular area for tourists. Massive shanty towns, the result of massive 20th century urban drift, are located on the city’s outskirts, the best known being the Afro-Colombian Barrio Nelson Mandela. Another environmental issue involves air pollution from vehicle emissions. Cartagena Peninsula looking towards the Old City. 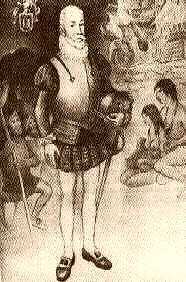 Spanish explorer Rodrigo de Bastidas. Cannons from the Colonial times over city walls. Attack at Cartagena de Indias by the English in 1741, oil on canvas, eighteenth century. 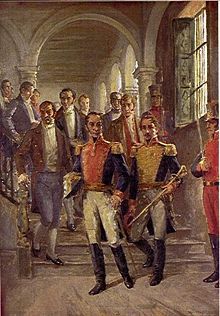 Francisco de Paula Santander, Simón Bolivar and other heroes of the Independence of Colombia in the Congress of Cúcuta. The official entrance to downtown, El Reloj, or Clock Gate. Primitive societies proliferated in the area that is now Cartagena because of the mild climate and abundant wildlife. The first documented human community in today's Colombia, the Puerto Hormiga Culture, which appeared around 7000 B.C.E. and lasted to around 3000 B.C.E., occupied the area from the Sinu river delta, in northwestern Colombia, to the Cartagena de Indias bay. 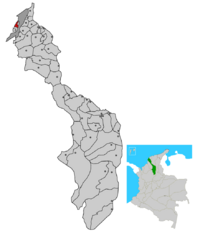 Around 3000 B.C.E., a more developed culture, the Monsú, lived near today's Cartagena neighborhoods of Pasacaballos and Ciénaga Honda, at the northernmost part of Barú Island. The Monsú culture inherited the Puerto Hormiga use of the art of pottery, and developed a mixed economy of agriculture and basic manufacture. Remnants of communal huts indicate that Cartagena was the seat of the first organized society in Colombia, and one of the most ancient in the Americas. Around 1500 B.C.E., the area was inhabited by Karib language Mocanae sub-family tribes including: The Kalamarí Tribe, in the downtown island; the Carex Tribe, on Tierrabomba island; the Bahaire Tribe, on Barú island, then the peninsula; the Cospique Tribe, on the eastern coast of the exterior bay, and the Yurbaco Tribe, in the suburban area of Turbaco. These tribes, though physically and administratively separated, shared common architecture, such as hut structures consisting of circular rooms with tall roofs inside wooden palisades. Spanish explorer Rodrigo De Bastidas (1468-1527) discovered the Magdalena River delta in his first journey in 1527. On his second trip, in 1530, De Bastidas noted the enormous Cartagena de Indias's bay of nine square miles with profound waters. 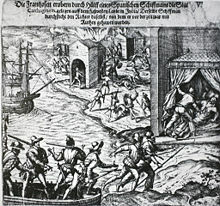 Spanish commander Pedro de Heredia (d. 1554) founded Cartagena de Indias on June 1, 1533, in the former seat of the indigenous Caribbean Kalamarí village. Cartagena, named after the port of Cartagena, Spain, gained fame when fleets stopped there to take on gold and other products of northern South America for convoy to Spain. As the city prospered, it attracted pirates and corsaires, including English admiral and privateer Sir Francis Drake, who took the city in 1585, and French admiral and privateer Sire Bernard Desjeans, Baron de Pointis, who raided Cartagena in 1697. To resist these attacks, during the seventeenth century the Spanish Crown hired European military engineers to construct fortresses. This construction took 208 years, and ended with some eight miles (11 km) of walls surrounding the city and the San Felipe de Barajas Castle, named in honor of Spain's King Philip IV, which was constructed to repel land attacks, equipped with sentry boxes, buildings for food and weapons storage, and underground tunnels. Later, when reviewing the costs of the defenses in Havana and Cartagena de Indias, Charles III of Spain, in his famed ironical style, is said to have exclaimed while taking his spyglass: "This is outrageous! For this price those castles should be seen from here!" Cartagena was a trading port. Gold and silver from the mines in New Granada and Peru were loaded in Cartagena on the galleons bound for Spain via Havana. Cartagena was also a slave port; Cartagena and Veracruz (Mexico) were the only cities authorized to trade with black people. The first slaves arrived with Pedro de Heredia and they worked as cane cutters to open roads, to desecrate tombs of the Sinu people, and to construct buildings and fortresses. On February 5, 1610, King Philip II by royal decree established the Inquisition Holy Office Court in Cartagena de Indias. The inquisitors left in 1821, but the Inquisition Palace, finished in 1770, remains. In 1717, Cartagena became part of the Spanish colonial Viceroyalty of New Granada, which corresponded mainly to the modern nations of Panama, Colombia, Ecuador, and Venezuela. In March 1741, British and American colonial troops led by Admiral Edward Vernon arrived at Cartagena with a fleet of 186 ships and 23,600 men against six Spanish ships and 3600 men, in an action known as the Battle of Cartagena de Indias. After weeks of intense fighting, the siege was repelled by the Spanish and native forces led by commander General Blas de Lezo. This victory prolonged Spain's control of the Caribbean, which helped secure its large Empire until the nineteenth century. With the arrival of news that Napoleon's French forces conquered southern Spain, Cartagena de Indias established a junta on May 22, 1810. Battles broke out between cities and towns of the former Viceroyalty of New Granada as each tried to defend its sovereignty. By mid-1815, a large Spanish expeditionary force under Pablo Morillo had arrived in New Granada. Cartagena fell in December of that year, and by May 1816, the royalists had control of all of New Granada. From then, the independence struggle was led mainly by Simón Bolívar and Francisco de Paula Santander in neighboring Venezuela. Bolívar returned to New Granada only in 1819 after establishing himself as leader of the pro-independence forces in the Venezuelan llanos. From there, he led an army over the Andes and captured New Granada after a quick campaign that ended at the Battle of Boyacá, on August 7, 1819. The territory of the Viceroyalty of New Granada became the Republic of Greater Colombia, organized as a confederation along with Ecuador and Venezuela (Panama was part of Colombia). Bolívar and Santander became the first two presidents of Colombia. The Spanish controlled Cartagena from 1815 to 1821, when patriot forces recaptured the city. Cartagena continued as Colombia’s leading port, although hampered by poor transport within the country. 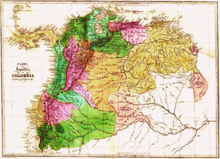 Internal divisions led to the secession of Venezuela and Quito (today's Ecuador) in 1830. The name "New Granada" was used until 1856, when it became the Grenadine Confederation. After a two-year civil war, in 1863, the United States of Colombia was created, lasting until 1886, when the country became known as the Republic of Colombia. U.S. intentions to build the Panama Canal led to the separation of Panama in 1903, and its establishment as a nation. The opening of the Magdalena River valley petroleum fields after 1917, was a boost to Cartagena, especially the completion of the Barrancabermeja to Bahía de Cartagena pipeline in 1926, as well as the construction of an oil refinery. Tensions between the two leading political parties led to the assassination of the Liberal presidential candidate on April 9, 1948. This ignited La Violencia ("The Violence"), causing violence that spread throughout the country and claimed the lives of at least 180,000 Colombians. From 1953 to 1964 the violence between the two political parties decreased, first when Gustavo Rojas (1900-1975) deposed the president in a coup d'etat and negotiated with the guerrillas, and then under the military junta of General Gabriel París Gordillo. A coalition government known as the National Front, in which the presidency would alternate between parties every four years, ended "La Violencia" and sought to institute social and economic reforms. But social and political injustices continued, and guerrilla movements including the Revolutionary Armed Forces of Colombia (FARC), and the National Liberation Army (ELN), and M-19 appeared. Emerging in the late 1970s, powerful and violent drug cartels developed during the 1980s and 1990s. The Medellín Cartel under Pablo Escobar and the Cali Cartel, in particular, exerted political, economic and social influence in Colombia during this period. A new constitution was ratified in 1991 that included key provisions on political, ethnic, human, and gender rights, which have been gradually put into practice, though uneven developments, surrounding controversies, and setbacks have persisted. Although serious problems remained in 2006, the government's respect for human rights continued to improve, according to the U.S. State Department's 2006 "Report on Human Rights Practices." By 2008, the internal armed conflict continued between the government and terrorist organizations. 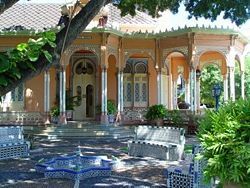 Home of Teresita Román de Zurek, well loved for her contributions to Colombian culture and its preservation, especially the city of Cartagena. Her work with the needy and the city itself earned her the title of "Honorary Mayor of the City of Cartagena de Indias" in 2006. Colombia is a republic in which the executive branch dominates government structure. The president, who is elected by popular vote for a four-year term, is both the chief of state and head of government. The cabinet consists of a coalition of the three largest parties that supported the president. The bicameral congress consists of the senate, of 102 members, and the house of representatives, of 166 members. Both houses are elected by popular vote to serve four-year terms. Since President Álvaro Uribe took office in 2002, he has increased Colombia's stability by significantly boosting its military strength and police presence throughout the country. This has helped increase international tourism. Colombia is divided into 32 departments and one capital district which is treated as a department. There are in total 10 districts assigned to cities in Colombia. Cartagena is responsible for one district. Departments are subdivided into municipalities, each with a municipal seat capital city assigned. Cartagena is capital of the Bolívar Department. Municipalities are subdivided into corregimientos. Each department has a local government which is headed by a department governor and its own department assembly elected for a period of four years in a regional election. Each municipality is also headed by a municipal mayor and a municipal council. Corregimientos have an elected corregidor or local leader. Cartagena's mayor Judith Pinedo won a surprise electoral victory in October 2007, when she ran on a platform of defeating a corrupt political machine in which Cartagena’s treasury was systematically looted. San Pedro Claver square at night. Colombia's economy underwent positive growth over the five years to 2008 despite armed conflict. The economy continues to improve because of austere government budgets, focused efforts to reduce public debt, an export-oriented growth strategy, improved domestic security, and high commodity prices. Ongoing economic problems include reforming the pension system, reducing high unemployment, and funding new exploration to offset declining oil production. Sugar and tobacco are processed in Cartagena, while other products of the city include cosmetics, textiles, fertilizer, and leather goods. Colombia's main exports include manufactured goods (41.32 percent), petroleum (28.28 percent), coal (13.17 percent), and coffee (6.25 percent). The construction of new skyscrapers fueled a property boom in Cartagena. As of October 2007, there were 42 high-rises under construction, including Colombia's tallest, the Torre de la Escollera. The new high-rise, extraordinarily narrow, was expected to be completed in early 2007, and was planned to stand at 676 ft (206 m) and have 58 floors. However, a construction defect accentuated by the strong Caribbean winds, has led to its dismantling. The building reached the 56th floor (in girders, solely) before the wind bent the structure severely. A new, 20-story building will be constructed in its place. Even though Colombia has been plagued with travel advisories because of the activities of guerrilla groups, it has continued to attract increasing numbers of tourists, especially medical tourists. Cartagena has become a center for plastic surgery, dental treatment, and the latest technology in bariatric weight-loss operations for people from the United States and in other developed nations, where health services costs continue to rise. Cartagena's port consists of a terminal at Manga, and a private container terminal at Contecar. Rafael Núñez International Airport is located in Crespo, a northern neighborhood. It is the second largest airport on the Caribbean coast of Colombia, and the largest in the region in terms of passenger movement. 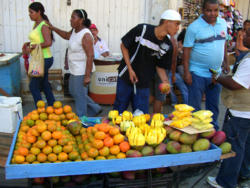 The informal economy in Cartagena. Cartagena had a total population of 1,239,430 in 2006, with 149,303 in its metropolitan area and 1,090,127 in its urban area, making it the fifth largest urban area in Colombia. Movement from rural to urban areas was heavy in the mid-twentieth century but has since tapered off. Colombia's diverse population reflects its colorful history. Mestizo make up 58 percent of the population, white 20 percent, mulatto (mixed black and white) 14 percent, black four percent, mixed black-Amerindian three percent, and Amerindian one percent. After the abolition of slavery around 1819, a national ideology of mestizaje encouraged the mixing of the indigenous, European, and native Amerindian communities into a single mestizo ethnic identity. Spanish is the official language. While the government does not collect religious statistics, more than 95 percent of the population adheres to Christianity, of which 81 to 90 percent are Roman Catholic. About one percent practice indigenous religions, and under one percent practice Judaism, Islam, Hinduism, and Buddhism. Colombia has become notorious for its illicit drug production, kidnappings, and murder rate. In the 1990s, it became the world's largest producer of cocaine and coca derivatives. Cultivation of coca in 2000 was estimated at 402,782 acres (1630 km²). Drug cartels began utilizing terror to increase their bargaining power with the government. This resulted in homicide becoming the leading cause of death in the nation. Colleges and universities include: Universidad Tecnológica de Bolivar, Universidad del Sinú, Escuela Superior de Bellas Artes "Cartagena de Indias," and Colegio Mayor de Bolívar. 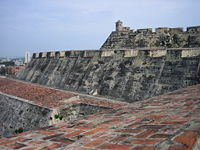 The "Port, Fortresses and Group of Monuments, Cartagena" were selected in 1984, as a World Heritage Site by UNESCO for having the most extensive fortifications in South America. The San Sebastián del Pastelillo Fort, in Manga, built low to avoid cannon fire from the Castle of San Felipe. The fort replaced the medieval Tower of Boquerón. The Santa Cruz de Castillogrande Fort, a cross shaped fort which controlled the entry in the inner bay. The San Juan de Manzanillo Fort, which was smaller and on the opposite side of the strait. The San Luis de Bocachica fort, a beautifully finished cross shaped fort which dominated the Bocachica strait, destroyed by Admiral Vernon in 1741. The San Fernando de Bocachica fort, nearer the sea, with space for more musketeers rather than massive cannons. 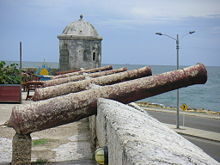 The San José de Bocachica batteries, built low to fire upon ships. The Angel San Rafael Battery, the only example in the world of "inside defense." The battery, with few cannons to the outside, was intended to attract attackers into a dry moat through a tunnel. Once inside, the attackers would be slaughtered by 400 muskets aimed through "devil holes." The battery was recently restored. The Santa Barbara Battery, near the tunnel entrance to Angel San Rafael, was a small battery used as a decoy to attract attackers to the tunnel entrance. Only a few foundation stones remain. The Batteries of Chamba and Santiago, destroyed by Admiral Vernon. The Batteries of Mas, Crespo and the Revellín of El cabrero, destroyed by erosion and the city's building work. The walls of the old city, which are seven miles (11 km) long and include more than 20 mini forts, four auxiliary doors, and one bridge-fort to connect the city to the mainland. Cartagena's Cathedral, with its massive exterior, simple interior and fortress appearance was begun in 1575, partially demolished by Sir Francis Drake's cannons, and completed in 1602. The restored Santo Domingo Church, in front of Plaza Santo Domingo (Santo Domingo Square). The square has the sculpture Mujer Reclinada ("Reclining Woman"), a gift from the renowned Colombian artist Fernando Botero. Heredia Theater, an architectural jewel located in front of the Plaza de la Merced. A few meters away is the Calle de la Factoría (Factory St); on it is the Marquis of Valdehoyos House which now functions as the Historical Photographic Library. Museo de Oro y Arqueloguía on the Plaza Bolivar, has a good collection of gold and pottery of the Sinú culture. The Palacio de la Inquisicíon is a fine example of colonial architecture. Behind the charming facade, a museum displays instruments of torture from the Spanish Inquisition, pre-Columbian, colonial and independence-era art. Colombia’s notoriety for its illicit drug production, kidnappings, and murder have required efforts to foster stability by boosting its military strength and police presence throughout the country. These efforts have helped Cartagena to capitalize on its pleasant climate and status as a World Heritage Site. Colombia suffers from serious human rights abuses from many fronts. 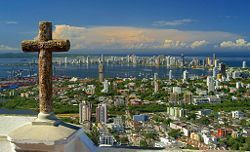 And while the drug cartels and terrorists continue their activities inland and governmental corruption continues, the city of Cartagena faces significant challenges. The Center for International Policy's Colombia Program. June 30, 2008. McCain in Colombia: don’t embody “Bush’s third term” in Latin America. Retrieved August 23, 2008. Olsen, Margaret M. 2004. Slavery and Salvation in Colonial Cartagena de Indias. Gainesville: University Press of Florida. ISBN 9780813027579. Román de Zurek, Teresita, Estella Arango de Morales, Angel De Miguel, and Hellen Karpf. 2001. The Cuisine of Cartagena de indias: Legacy of the Spanish Cooking in Colombia. Bogotá, D.C., Colombia: Gamma. ISBN 9789589308905. Samudio Trallero, Alberto. 2006. Cartagena de Indias: The Jewel of the Caribbean. Cartagena, Colombia: I/M Editores. ISBN 9789589343012. The Washington Times. 2007. Cartagena's healthy business climate. Retrieved August 23, 2008. This page was last modified on 16 January 2017, at 17:22.